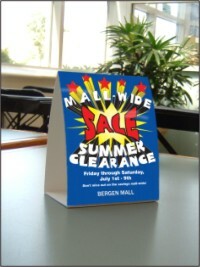 Product Description: Our Deluxe Laminated Table Tents are HEAVY DUTY! Printed in full-color with a gloss laminate, they will stand up to splashes, smudges and fingerprints for weeks on end! These are an economical alternative to expensive and fragile acrylic holders. Includes adhesive strip for secure closure. Shipped flat. SETUP FEE: A $20.00 setup fee applies to orders of 49 items or less of a given design and layout. The setup fee is waived for this design if it isn't customized (your logo is always included at no additional cost). Setup fees are automatically added to your shopping cart.